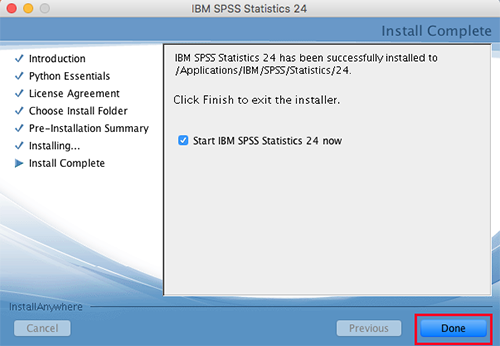 Install the IBM SPSS Statistics file you downloaded from software.usc.edu/spss. 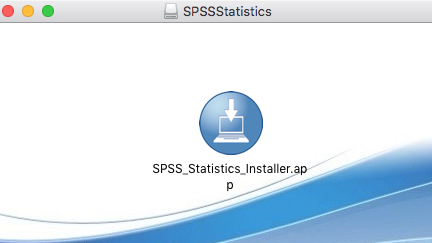 Double-click the SPSS Statistics Installer icon on your desktop. 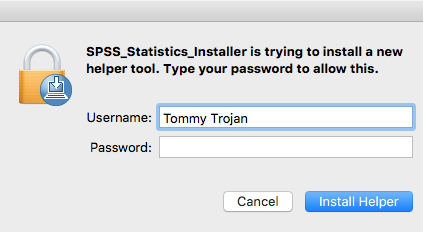 You may need to authorize the installer. 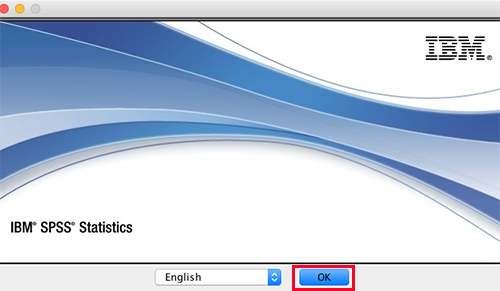 Enter your computer’s login name and password and then click Install Helper to authorize the installer. 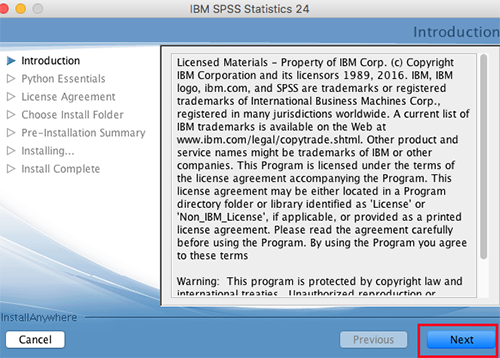 On the IBM SPSS Statistics screen, click OK.
On the IBM SPSS Statistics – Introduction screen, click Next. 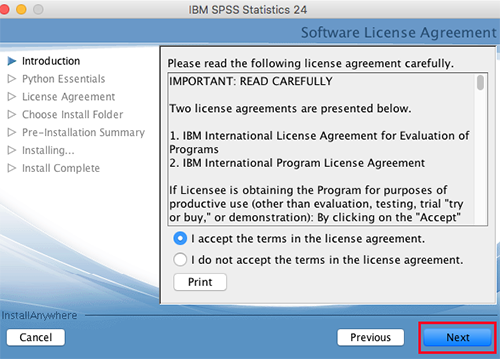 On the IBM SPSS Statistics – Software License Agreement screen, select I accept the terms in the license agreement and click Next. 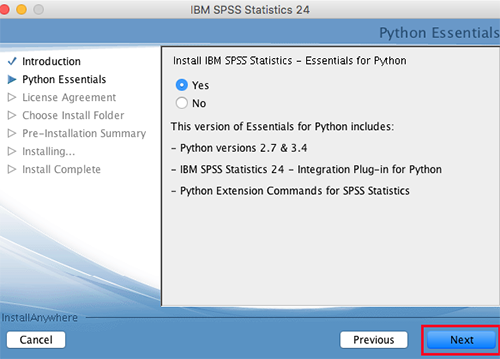 On the IBM SPSS Statistics – Install Python Essentials screen, under Install IBM SPSS Statistics – Essentials for Python, select Yes. Click Next to continue to the next screen. The following license agreement screen will appear. 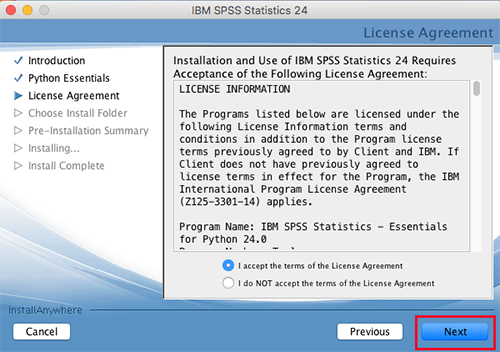 Select I accept these terms of the License Agreement and click Next to continue with the installation. 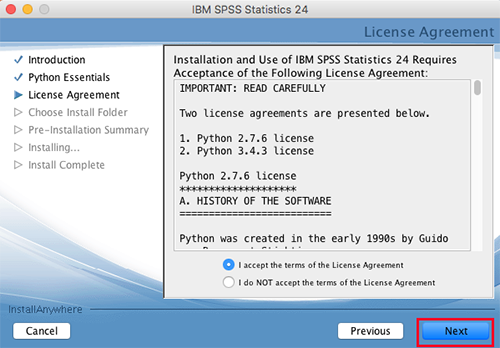 The IBM SPSS Statistics – License Agreement for Essentials for Python screen will appear , select I accept the terms in the license agreement and click Next to continue the installation. 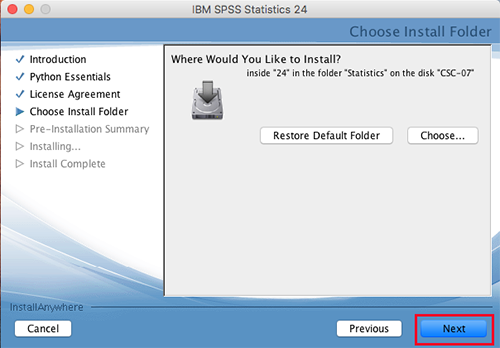 On the IBM SPSS Statistics – Choose Install Folder screen, choose the location where you would like to install SPSS. Click Next. 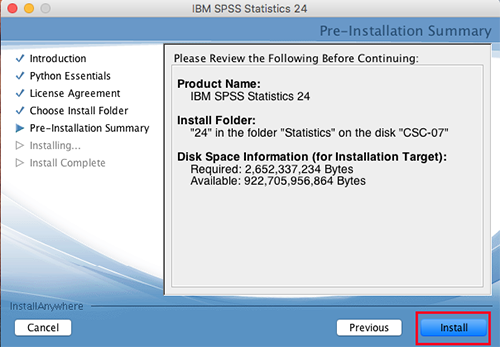 On the IBM SPSS Statistics – Pre-Installation Summary screen, click Install. 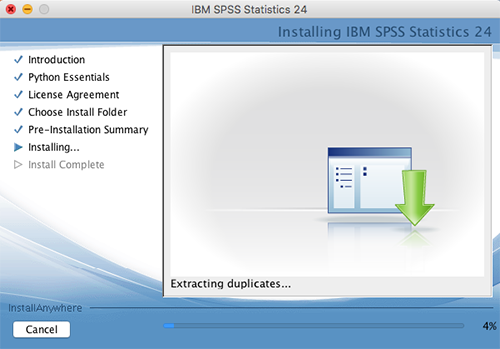 SPSS will now install. This process takes approximately 2-5 minutes. 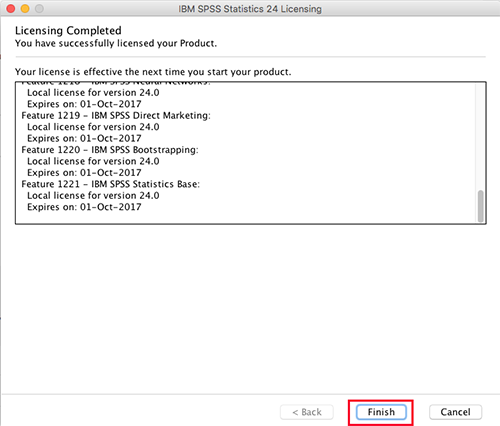 The IBM SPSS Statistics – Install Complete screen will appear, click Done to finish the installation process and launch IBM SPSS Statistics. 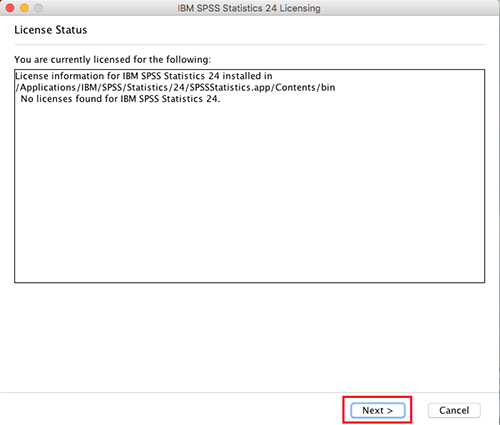 When you launch IBM SPSS Statistics for the first time, you will see the following screen. 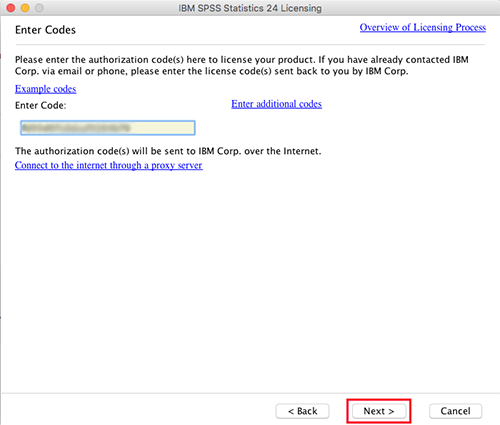 Click License Product to enter the license key you received from ITS and authorize your copy of IBM SPSS Statistics. NOTE: You must be connected to the Internet to successfully complete the authorization process. The License Status screen will appear. Click Next. 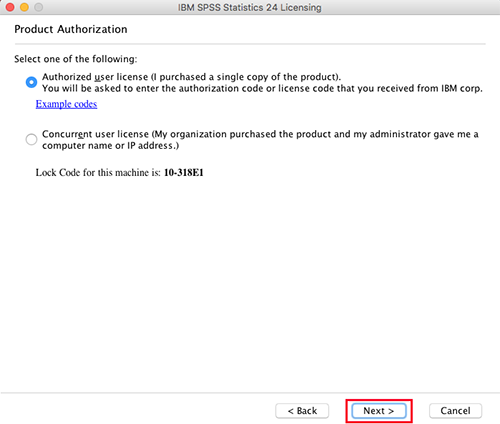 On the Product Authorization screen, choose Authorized user license (I purchased a single copy of the product). and then click Next. On the Enter Codes screen, enter your authorization code. When purchased your software from ITS, you should have received an email with this authorization code. Once the authorization process is complete on the Internet Authorization Status screen, click Next. 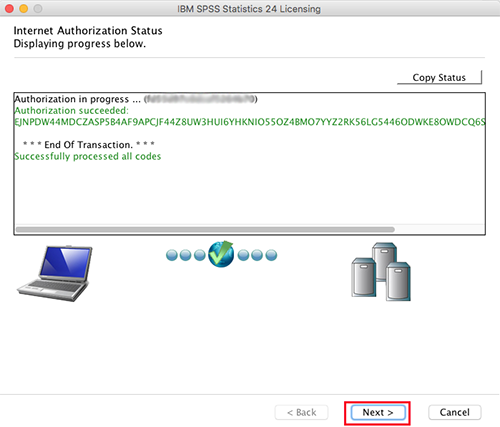 On the Licensing Completed screen, click Finish to complete the installation. 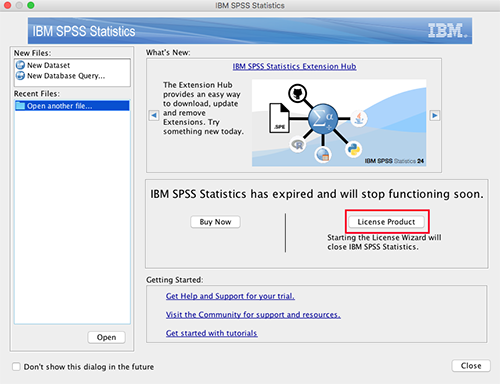 NOTE: ITS suggests you open IBM SPSS Statistics once the installation and authorization has finished to ensure that the software has installed correctly.